Beyond how the firing requirements of these metals impact my time (discussed last time), each piece that size also puts 8 times the wear & tear on my kiln when compared to a similar piece made from fine silver. On top of that, other kiln-related factors like the time and temperature combinations and the oxygen-reduced atmospheres used with these clays will further shorten the expected lifetime of the kiln. While I do still expect the kiln to last for years, I also figure that I need to add a bit more to the price of each base-metal piece so that, when the time comes, I will be able to replace that relatively expensive piece of equipment earlier than might otherwise be expected. Covering the cost of firing boxes and carbon will also add a little bit to each copper, bronze, and/or steel piece too; they are not needed with the precious metals. Each time I use a new kind of box or of carbon, there’s both time and material involved in testing the firing schedule. I should somehow spread that (small but real) cost over a range of subsequent pieces too. I’m still working out which tools to share across the various metals (meaning I have to spend time cleaning them thoroughly each time I switch between the precious and non-precious metals) versus which tools I use often enough that I should just buy another copy of the same one to use with the base metals (and clearly label each so I don’t get them confused, and have to spend time washing anyway). Either way, however, there are small portions of the total cost to be spread across a number of items I’ll make with them. I ended up buying a small refrigerator for my studio too: while there is a nice little bonus in having that to keep some lunch and beverage items cold, I see it as overhead for these pieces because I need to freeze any pre-mixed clay that I don’t use in a single session. For pieces that require extra finishing time, there is also the cost of extra items used for sanding and finishing since they will thus wear out much more quickly. That also adds a little more to the cost of each such item. That’s not even a complete list of the extra costs, but it’s a good sample of them. Now, none of those involve earth-shattering amounts. But there are other forms of “overhead” to be accounted for with every piece made, regardless of medium, and then every time you add a few cents for this, and then a few more for that because you’re working with base metals, and then you apply the appropriate mark-up factors (e.g., gallery commissions) to the whole thing …. well, the sum-total of such additions simply runs up the final price of any artwork. No: not the age of 40. No: not the speed limit. Yes: the price of silver. I wasn’t paying attention to prices yesterday (busy day…) and missed it at the time, but silver crossed the $40-mark on Friday. Yeah, I get the “economic theory” that drives investors to metals, and especially to “precious” metals. I just happen to think that many of the things that can be done with those materials should be even more precious. Why do “they” want to destroy the simple pleasure that can be drawn from small precious metal artwork and adornments? Why do the rest of us let them? What are the alternatives, for them and for us? Why can’t “those people” go find something useful to invest in? Something practical? Something for the good of others too? Something that would benefit society? Something that would still be of benefit to them (yes, I understand that part) but something that doesn’t have to mean the detriment of others at the same time? Why is it you versus me? Why can’t we revise the basic definition of good to mean only if it’s good for all? I started this blog on January 1, and here it is December 31. How can it be a year already? Weeks, sure. Months, possibly. But a whole year? And quite a year it’s been too. The new studio tops the looking-back list for me, but then there are also all tne new projects, people, outlets, workshops, opportunities and more. But I can’t ignore the fact that silver closed out the year trading at $30.92 per troy ounce. It had started 2010 at $16.85. For that matter, it had started 2009 at $11.33. Gold rose to within USD 10 of a record high…, closing out an unprecedented tenth annual gain as the combination of a weaker dollar and global economic uncertainty seemed to pave the way higher next year. The entire precious metals complex had a stellar run in 2010, led by palladium’s 97 percent rise, in a broad commodities rally that pushed the 19-commodity Reuters-Jefferies CRB index .CRB up 15 percent. Spot silver, too, swept higher for an 83 percent gain on the year, as investors sought the white metal as an alternative to gold. It was the best-performing assets in the CRB, hitting a 30-year peak of USD 30.92 on Friday. Investors: Please don’t limit yourselves to “plain” silver and other precious metals. Please invest in those of us who are able to turn them into lovely adornments! Approaching 27 as I write this…. So I thought maybe I could quit commenting on the price of silver for a little while. Have I mentioned that I seem to lead a rich fantasy-life? The last time I commented on this, a month ago tomorrow, the price of silver had risen to a nominal price of $23/troy ounce. In the past month, it’s mostly fluctuated up and down between $23 and $24, but I had enough else going on that such bouncing didn’t seem to require a comment. But the last three days, well, that’s another story. Today the price started bouncing up around $27/troy ounce: silver has had a three dollar increase in a mere three days! Was it the election, or the “monetary easing,” or what? Call me naive (and, yes, I do actually understand enough basic economic theory to know why this next statement is yet more fantasy) but I just wish that “investors” would go find something else to play around with amongst themselves, and stop messing with real products that real people use. Having fouled up the housing market, can’t they please keep their grubby hands out of the metals market and more?! I need to order the materials for the classes I have coming up, and I really don’t want people (especially the “new” participants via my new studio) to think I’m gouging them with the “materials fee” … which will come to waaaay more than what I make for my actual teaching (that is, for my own expertise). Sigh. That is, today silver’s been trading at a nominal price that’s now up around $23 per ounce. Of course, it’s not just silver. Gold is approaching $1,350/oz, and platinum is close to $1,700/oz. In that sense, of course, silver is still “relatively affordable,” so I’m not thinking of making any major moves in one of those directions. 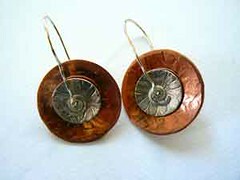 But other metals are spiking too, ones like copper and tin and more. Hmmm, where might all this be going … and what’s a girl to do while it does so?! 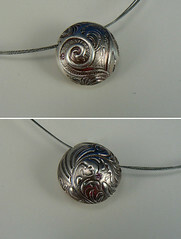 Silver clay has been available for a little over 10 years. Aside from a relatively brief price spike (well, it did last several years in the late 1970s – early 80s), the price of silver had been fairly stable for decades: a few dollars per ounce. In the last ten years, the price of silver has risen from approximately $4/oz to $22. That comes out to an average of about a half a penny ($0.005) per day. Except it has not been a steady rise. The start of the climb was very slow, hard to distinguish from normal seasonal fluctuations. Over the past year, however, the increase has gotten steeper: the one-year average is just about double the five-year average increase. Still under two cents / day but edging up to that. And over the last six months, its crossed that barrier, with an average of 2.5 cents/day increase in the “nominal” price of silver. Mind you, it’s not metal clays that are driving these increases. Investors are doing that; we’re just collateral damage. With unstable markets, economic uncertainties, questionable currencies, etc., investors shift to buying up things like precious metals. And their actions affect the prices that everyone must pay, metal clayers and other jewelers, product manufacturers, and more, and then pass on to the eventual consumer. I hadn’t planned to mention all this a second time, but I’d had a DVD playing as I worked this morning and, when it ended, the system switched to TV which was showing The View. (I don’t normally watch it–don’t watch much TV in general–but will occasionally catch a couple minutes of something like that before I stop what I’m doing to turn it all off.) There was a discussion of “should you buy gold or platinum now, given how high the prices are” and the answer was that “there is no reason to think they won’t go even higher.” Some “expert” then started advising people to invest “in metals, but on paper” (my terms, not theirs); that is, do it via a broker so that they didn’t have to worry about storing and safekeeping the actual stuff themselves. And then Whoopi Goldberg chimed in with, “But why not just go and buy some great jewelry?” Sadly, she was answered with a few laughs and a commercial break, and then that segment of the program was over. But I thought Whoopi offered a great suggestion! Don’t you? Measuring the Price of Silver. Do you follow the “price” of silver? It looks like it hit right around $21/oz on some foreign markets for a brief moment earlier this morning (around 4 am New York City time). That’s back when I first got interested in metalsmithing; it was a secondary reason why I didn’t pursue this more actively at that time. The primary reason was that I tried several different classes, all of which were very unpleasant experiences. I wondered then, and more recently confirmed, that it was just my luck to have drawn a few really dreadful teachers. But watching the raw material price climb from its historic $5/oz to $50/oz at the same time sure didn’t provide an incentive to try more classes. Instead, I just started prowling antique shops, estate sales, flea markets, and the occasional museum, to examine and admire older pieces and gain a different kind of education, a better appreciation of what others had done over time with precious metals, gemstones, and more. Oh, and the ounces we’re talking about are troy ounces. I resist the urge to include here a math lesson on troy versus avoirdupois weights. (Gold and silver merchants use the former; bakers and butchers use the latter.) I can do so if anyone requests it…. For now I’ll just point out that a troy ounce is heavier than an avoirdupois ounce, while a troy pound is lighter than an avoirdupois pound! Which is why a lot of people prefer metric measures: a gram is a gram, a kilogram is a thousand grams, no matter what you’re weighing. At the bottom of this SilverPrice.org page is a chart that goes back before the silver price spike I mentioned above.